“[T]he principles of thermodynamics have been in existence since the creation of the universe” (Cengel and Boles, 2002, p. 2, emp. added). So states a prominent textbook used in schools of engineering across America. Indeed, these principles prove themselves to be absolutely critical in today’s science world. Much of the engineering technology available today is based on the foundational truths embodied in the Laws of Thermodynamics. As the writers of one engineering thermodynamics textbook stated: “Energy is a fundamental concept of thermodynamics and one of the most significant aspects of engineering analysis” (Moran and Shapiro, 2000, p. 35). Do these laws have application to the creation/evolution debate as creationists suggest? What do they actually say and mean? The word “thermodynamics” originally was used in a publication by Lord Kelvin (formerly William Thomson), the man often called the Father of Thermodynamics because of his articulation of the Second Law of Thermodynamics in 1849 (Cengel and Boles, p. 2). The term comes from two Greek words: therme, meaning “heat,” and dunamis, meaning “force” or “power” (American Heritage..., 2000, pp. 558,1795). 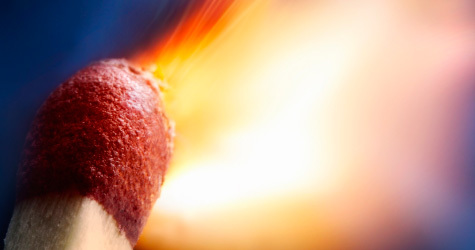 Thermodynamics can be summarized essentially as the science of energy—including heat, work (defined as the energy required to move a force a certain distance), potential energy, internal energy, and kinetic energy. The basic principles and laws of thermodynamics are understood thoroughly today by the scientific community. 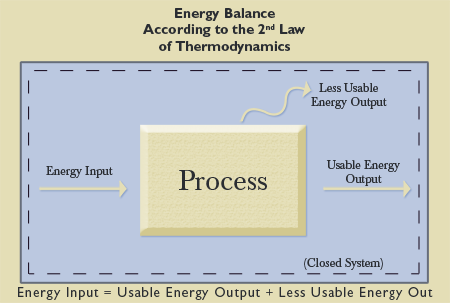 Thus, the majority of the work with the principles of thermodynamics is done by engineers who simply utilize the already understood principles in their designs. A thorough understanding of the principles of thermodynamics which govern our Universe can help an engineer to learn effectively to control the impact of heat in his/her designs. Though there are many important thermodynamic principles that govern the behavior of energy, perhaps the most critical principles of significance in the creation/evolution controversy are the First and Second Laws of Thermodynamics. What are these laws that, not only are vital to the work of an engineer, but central to this debate? The basis of every law of nature is experimental evidence, and this is true also of the first law of thermodynamics. Many different experiments have been conducted on the first law, and every one thus far has verified it either directly or indirectly. The first law has never been disproved (Borgnakke and Sonntag, 2009, p. 116, emp. added). But what’s really important is that these physical laws, as well as being unchangeable, are universal. They apply not just to the flight of the ball, but to the motion of a planet and everything else in the Universe. Unlike laws made by humans, the laws of nature cannot ever be broken. That’s why they are so powerful…. [T]he laws of nature are fixed (“Curiosity: Did God Create the Universe?” 2011, emp. added). [T]he celebrated second law of thermodynamics…says, roughly speaking, that in any change the Universe becomes a slightly more disorderly place; the entropy goes up, the information content goes down. This natural tendency towards disintegration and chaos is evident all around us (1978, 80:506). Entropy is simply a fact of nature. Entropy can be minimized in this Universe, but it cannot be eradicated. That is where engineers come in. Engineers work to discover ways of minimizing energy loss and maximizing useful energy before it is forever lost. Thousands of engineering jobs are dedicated to addressing this fundamental fact of the Second Law of Thermodynamics. Your energy bill is affected directly by it. If the Second Law was not fixed—unchanging—engineers could not develop the technology necessary to maximize usable energy, thereby lowering your energy costs. [W]e can say that the second law of thermodynamics (like every other law of nature) rests on experimental evidence. Every relevant experiment that has been conducted, either directly or indirectly, verifies the second law, and no experiment has ever been conducted that contradicts the second law. The basis of the second law is therefore experimental evidence (2009, p. 220, emp. added, parenthetical item in orig.). Another thermal science textbook says, concerning the Second Law of Thermodynamics, “To date, no experiment has been conducted that contradicts the second law, and this should be taken as sufficient proof of its validity” (Cengel, Turner, and Cimbala, 2008, p. 266, emp. added). When understood properly, the Laws of Thermodynamics apply directly to the creation/evolution controversy in precisely the same way they apply in the engineering world today (cf. Miller, 2007). In fact, these foundational truths, utilized daily by the engineering world, have eternally significant, spiritual implications in that they prove that God exists. How so? If there is no God, the existence of the Universe must be explained without Him. The Big Bang theory claims that all matter in the Universe initially was condensed in a sphere smaller than the size of a period at the end of this sentence. That sphere exploded and helps to explain why the Universe, according to many cosmologists, appears to be expanding or inflating (see Thompson, et al., 2003, 23:32-34,36-47). Even if the Big Bang were true (and it is not, cf. Thompson, et al. ), this theory offers no explanation for the origin of that sphere. Evolutionist Alan Guth, a cosmologist and physics professor at M.I.T., admitted that “[i]nflation itself takes a very small universe and produces from it a very big universe. But inflation by itself does not explain where that very small universe came from” (as quoted in Heeren, 1995, p. 148). He further stated, “[A] proposal that the universe was created from empty space is no more fundamental than a proposal that the universe was spawned by a piece of rubber. It might be true, but one would still want to ask where the piece of rubber came from” (Guth, 1997, p. 273). So where could the “rubber” have come from? The only logical possibilities for the origin of the matter and energy comprising the Universe are that they are responsible for their own existence (i.e., they popped into existence out of nothing—spontaneous generation or they always existed—eternality) or Someone is responsible for their existence (i.e., they were placed here by something outside of the Universe—Creation) (see Figure 3). As the well-known philosopher and evolutionist from the 19th century, Herbert Spencer said, “Respecting the origin of the Universe three verbally intelligible suppositions may be made. We may assert that it is self-existent [i.e., eternal—JM]; or that it is self-created [i.e., spontaneously generated—JM]; or that it is created by an external agency” (1882, p. 30). Consider the entire physical Universe as a system consisting of all mass, matter, and energy that exists in the Universe. If one believes in the Big Bang model, the system’s boundary would be outside of the blast radius of the Big Bang, or outside of the original cosmic dot that exploded. Without God (i.e., something outside of the bounds of the Universe—something supernatural), this Universe would have to be a closed system. Since our system encompasses the entire Universe, there is no more mass that can cross into our system from the outside, which necessitates our system being closed. If mass, matter, and energy could enter and/or exit the system, the system would be an open system[NOTE: The creationist contends that the Universe is an open system, since there is Someone outside of the natural Universe Who can cross the boundary and put matter and energy into the system. However, without God, the entire physical Universe as a system logically would have to be a closed system. Atheists must so believe in order to explain the Universe without God.]. Conservation of energy [i.e., the First Law—JM] and other basic laws hold true in the most distant observed galaxy and in the cosmic microwave background, implying that these laws have been valid for over thirteen billion years. Surely any observation of their violation during the puny human life span would be reasonably termed a miracle…. In principle, the creation hypothesis could be confirmed by the direct observation or theoretical requirement that conservation of energy was violated 13.7 billion years ago at the start of the big bang (2007, pp. 115-116, emp. added). 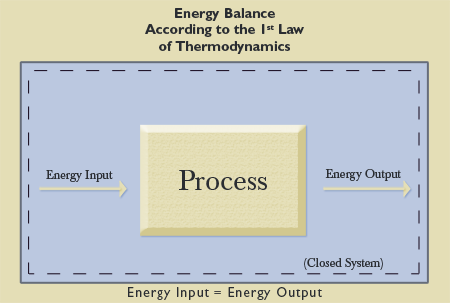 The First Law of Thermodynamics states that in a closed system, the amount of energy present in that system is constant, though it transforms into other forms of energy. So, if the Universe as a whole initially contained no mass, matter, or energy, and then all of the mass, matter, and energy in the Universe spontaneously generated, the First Law would be violated. Without intervention from an outside force, the amount of mass, matter, and energy in the Universe would have remained constant (unchanged) at nothing. 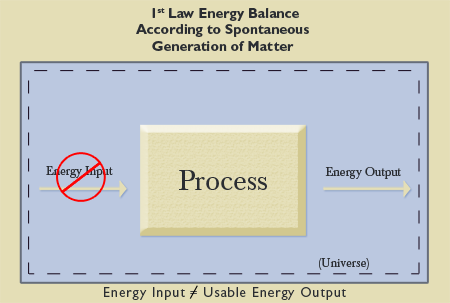 According to the scientific evidence, matter/energy could not have originally spontaneously generated. Thus, according to Stenger, the creation hypothesis is confirmed based on the scientific evidence. The initial creation of energy from nothing amounted to a miracle. As was mentioned earlier, there are no exceptions to laws, or else they would not be laws. The First Law of Thermodynamics has no known exceptions. The Law is accepted as fact by all scientists in general and utilized by engineers in particular. Therefore, the Universe, composed of all mass, matter, and energy, could not have spontaneously generated (popped into existence on its own) without violating the exceptionless and highly respected First Law of Thermodynamics. The energy level of the Universe would not have been constant. Spontaneous generation would amount to the creation of energy from nothing (see Figure 4). The Universe could not have come into existence without the presence and intervention of a Force outside of the closed system of the entire physical Universe. The Universe therefore must be an open system that was created by a non-physical Force (i.e., a Force not composed of mass, matter, and energy) outside of the physical boundary of this Universe (above nature, or supernatural) with the capability of bringing it into existence out of nothing. That Force can be none other than a supernatural God. To develop a theory that requires the violation of that principle would be against the scientific evidence. It would be unscientific. The evidence from science indicates that matter could not and cannot spontaneously generate. Unfortunately, though this truth is so glaringly obvious to many, there has been a recent surge of sentiment in the impossible notion that this Universe could have created itself—that something could come from nothing. British evolutionist Anthony Kenny (1980), physics professor from City University in New York, Edward Tryon (1984), and physicists Alan Guth from M.I.T. and Paul Steinhardt of Princeton (1984) are just a few who are open proponents of this notion. Stephen Hawking said, “Bodies such as stars or black holes cannot just appear out of nothing. But a whole universe can…. Because there is a law like gravity, the universe can and will create itself from nothing” (2010, p. 180). However, the truth still stands. Until the First Law of Thermodynamics ceases to be a fundamental law explaining this Universe, the spontaneous generation of this Universe from nothing is impossible. Science studies what occurs in nature, not super-nature. In nature, matter and energy can be neither created or destroyed, but “must remain unchanged forever.” This is a “firmly established fact.” Nothing comes from nothing. If a molecule will not pop into existence from nothing, a sphere containing all of the matter and energy of the entire Universe will certainly not pop into existence. Again, considering the entire Universe as a system necessitates that it be a closed system. The Second Law of Thermodynamics states that though energy in a closed system is constant (First Law of Thermodynamics), that energy is transforming into less usable forms of energy (i.e., the Universe is “running down”). This process is irreversible. There is a finite amount of usable energy in the Universe (which explains the widespread interest in conserving energy). In the Big Bang model, that energy was originally in the cosmic egg that exploded, and now would be found within the blast radius of the original explosion. That usable energy is depleting according to the Second Law. Engineers strive to slow this inevitable depletion of energy, but it cannot be stopped. 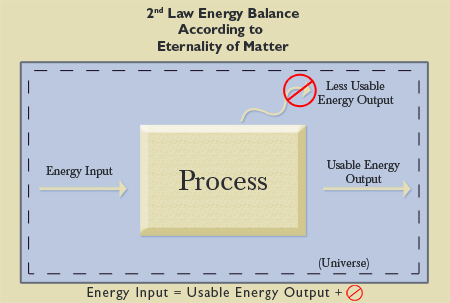 If the Universe has always existed (i.e., it is eternal), but there is a finite amount of usable energy, then all usable energy already should be expended (see Figure 5). Yet, usable energy still exists. So, the Universe cannot have existed forever. It had to have a beginning. The eternality of matter would be the equivalent of a system with an energy input and 100% usable energy output (see Figure 6). It would be the equivalent of describing the Universe as a perpetual motion machine—a design that attempts to violate either the First or Second Law of Thermodynamics by, for instance, running forever without an energy input. No such machine has ever been designed, since such a machine would violate the laws of thermodynamics. Philip Yam, writing in Scientific American said, “Claims for perpetual-motion machines and other free-energy devices still persist, of course, even though they inevitably turn out to violate at least one law of thermodynamics” (1997, 277:82). And concurrently there was a great deal of discussion about the fact that the second law of thermodynamics, applied to the Cosmos, indicates the Universe is running down like a clock. If it is running down, there must have been a time when it was fully wound up…. Now three lines of evidence—the motions of the galaxies, the laws of thermodynamics, the life story of the stars—pointed to one conclusion; all indicated that the Universe had a beginning (1978, pp. 48-49, 111). Evolutionist Kitty Ferguson, award-winning science writer, agreed. She said, “It’s also common knowledge that the universe isn’t eternal but had a beginning” (1994, p. 89). Any person who develops a theory that claims that the Universe could be a perpetual motion machine, is guilty of contradicting the solid evidence from science. They are being unscientific, and their unscientific mindset has resulted in an unscientific theory. What does the scientific evidence actually say about the matter of origins? Forget speculation, conjecture, hypothesis, and theory—wishful, hopeful thinking that there might be some way to avoid a supernatural explanation and the restrictions that Being might have on our desires. What does the evidence say? To repeat, logically, there are only three possible explanations for the existence of matter in the Universe. Either it spontaneously generated, it is eternal, or it was created by a non-physical Being outside of the boundaries of the Universe. Atheists use the theory of evolution in an attempt to explain the existence and state of the Universe today. In order for the theory of evolution to be true, thereby accounting for the existence of mankind, either all of the mass, matter, and energy of the Universe spontaneously generated (i.e., it popped into existence out of nothing), or it has always existed (i.e., it is eternal.). Without an outside force (a transcendent, omnipotent, eternal, superior Being), no other options for the existence of the Universe are available. However, as the Laws of Thermodynamics prove, the spontaneous generation and the eternality of matter are logically and scientifically impossible. One and only one possible option remains: the Universe was created by the Creator. The scientific evidence points to the existence of God. Bottom line: God designed the laws of thermodynamics. Creationists believe them. Engineers use them. Atheists cannot harmonize them with their beloved theory. Evolutionists claim that science and the idea of God are irreconcilable. “Only one of them can be true,” they say, “and you cannot prove there is a God.” Not all theistic models for the origin of the Universe are in keeping with science. For instance, according to Enuma Elish, the Babylonian creation account, the polytheistic Babylonians believed that matter is eternal (Pfeiffer, 1972, p. 226). This has been shown to be false. However, although not all Creation models are in harmony with the scientific evidence, one would expect the true Creation model to be in keeping with the evidence. The Laws of Thermodynamics, which science itself recognizes in its explanations of the phenomena in the Universe, were written by the Chief Engineer (cf. Miller, 2012). As expected, they prove to be in complete harmony with His existence, contrary to the claims of evolutionists. God, Himself, articulated these laws centuries ago in the Bible. At the very beginning of the Bible, the First Law of Thermodynamics was expressed when Moses penned, “Thus the heavens and the Earth, and all the host of them, were finished. And on the seventh day, God ended His work which He had done, and He rested on the seventh day from all His work which He had done” (Genesis 2:1-2, emp. added). In Exodus 20:11, Moses wrote, “For in six days, the Lord made the heavens and the earth, the sea, and all that is in them, and rested (i.e., ceased) the seventh day.” Everything in the Universe was made in six days, and then the Lord stopped creating. Nothing else is coming into existence naturally. After the six days of Creation, the mass, matter, and energy creation process was terminated. As evolutionist Willard Young said regarding the First Law: “Energy can be neither created nor destroyed, but can only be converted from one form to another.” The thrust of the First Law of Thermodynamics was expressed in the Bible thousands of years ago, although it was not discovered and formally articulated by scientists until the 19th century. Through the hand of the psalmist, God also stated centuries ago what scientists call the Second Law of Thermodynamics: “Of old You laid the foundation of the Earth, and the heavens are the work of your hands. They will perish, but You will endure; yes, they will all grow old like a garment; like a cloak You will change them, and they will be changed. But You are the same, and Your years will have no end” (102:25-27, emp. added). The Universe is wearing out—decaying, like an old shirt: the Second Law of Thermodynamics. Once again, the Creation model is in perfect harmony with science. The evolutionary model fails its thermodynamics test. The inspired writer wrote in Hebrews 11:3, “By faith we understand that the worlds were framed by the word of God, so that the things which are seen were not made of things which are visible.” Paul declared in Acts 14:17, “Nevertheless He did not leave Himself without witness, in that He did good, gave us rain from heaven and fruitful seasons, filling our hearts with food and gladness.” The psalmist affirmed, “The heavens declare the glory of God; and the firmament shows His handiwork” (19:1). Paul assured the Romans, “For since the creation of the world His invisible attributes are clearly seen, being understood by the things that are made, even His eternal power and Godhead, so that they are without excuse” (1:20, emp. added). The scientific evidence points to God. There will be no excuse in the end for those who deny it. I do not say that, with regard to the origin of life, science neither affirms nor denies Creative Power. Science positively affirms Creative Power…. It is not in dead matter that we live and move and have our being [Acts 17:28—JM], but in the creating and directive Power which science compels us to accept as an article of belief.... There is nothing between absolute scientific belief in a Creative Power, and the acceptance of the theory of a fortuitous concourse of atoms.... Forty years ago I asked Liebig, walking somewhere in the country if he believed that the grass and flowers that we saw around us grew by mere chemical forces. He answered, “No, no more than I could believe that a book of botany describing them grew by mere chemical forces”.... Do not be afraid of being free thinkers! If you think strongly enough you will be forced by science to the belief in God, which is the foundation of all Religion. You will find science not antagonistic but helpful to Religion (as quoted in Thompson, 1910, pp. 1097-1100, emp. added). According to the Father of Thermodynamics, evolutionists are failing to “think strongly enough.” No wonder the psalmist asserted: “The fool has said in his heart, ‘There is no God’” (14:1). Cengel, Yunus A., Robert H. Turner, and John M. Cimbala (2008), Thermal-Fluid Sciences (New York, NY: McGraw-Hill). Miller, Jeff (2012), “‘The Laws of Science’-by God,” Reason & Revelation, 32:137-140, December, http://www.apologeticspress.org/apPubPage.aspx?pub=1&issue=1103&article=2072. Pfeiffer, Charles F. (1972), The Biblical World (Grand Rapids, MI: Baker Book House). Spencer, Herbert (1882), First Principles: A System of Synthetic Philosophy (New York: D. Appleton and Company), fourth edition. Stenger, Victor J. (2007), God: The Failed Hypothesis (Amherst, NY: Prometheus Books). Thompson, Silvanus P. (1910), The Life of William Thomson Baron Kelvin of Largs, Vol. 2, (London: MacMillan and Co.). Thomson, William (1882), Mathematical and Physical Papers (Cambridge University Press). Yam, Philip (1997), “Exploiting Zero-Point Energy,” Scientific American, 27782-85.